Funny travel stories: Wake up and smell the volcano ash, people. 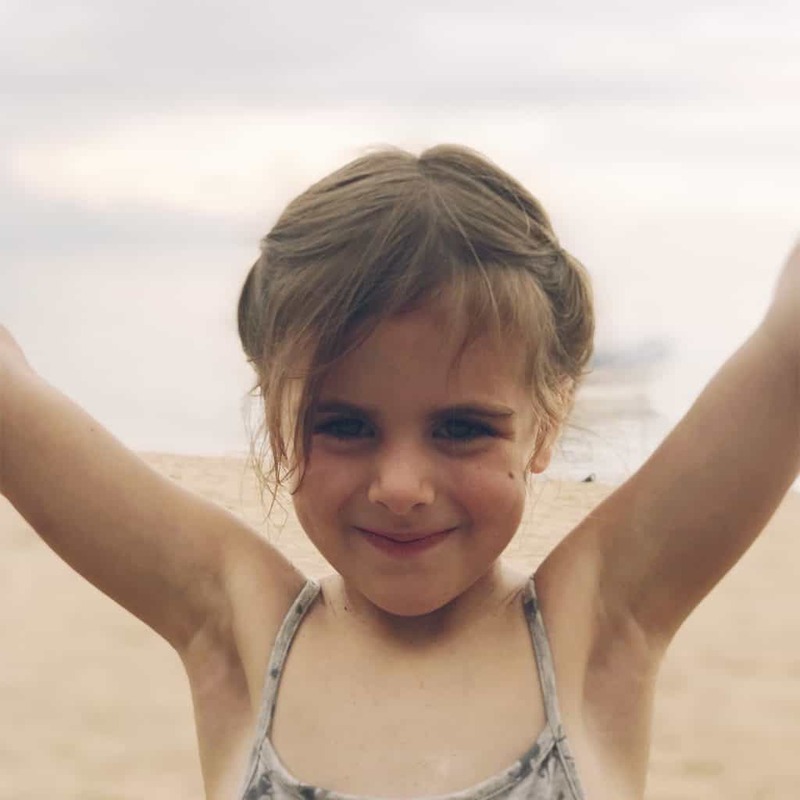 We are due to fly out of Bali this Thursday, ‘in three sleeps’ as our five-year-old keeps reminding us. 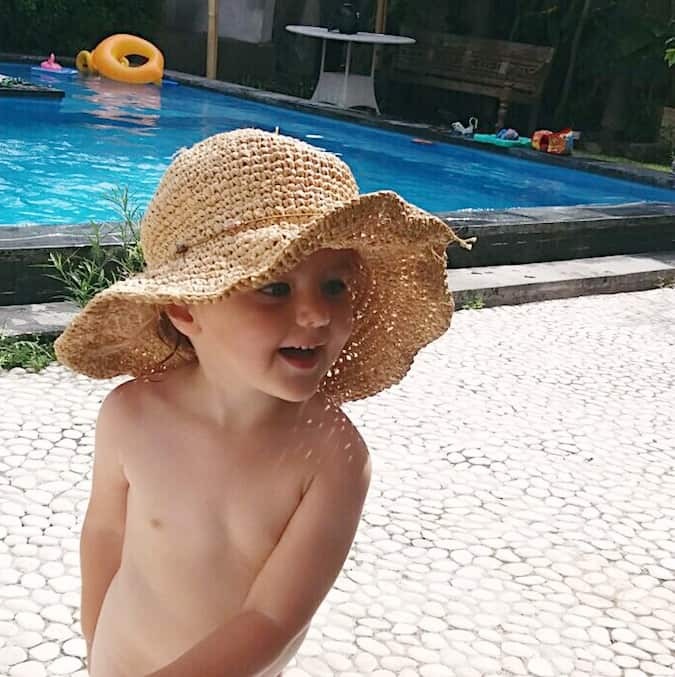 We love Sanur but after six weeks here (where did the time go?!) we are ready to move on and are all really looking forward to a week in Bangkok, followed by three weeks’ volunteering at a children’s charity on the Thai-Myanmar border. Unfortunately Mount Agung had other ideas, the rapscallion, and decided a couple of days ago to “cough” a load of ash and smoke and whatever else volcanoes cough. Thankfully for the people here it’s not a full eruption, although there are lots of people who are moving out of the area as it’s not safe. It is, also, super inconvenient for thousands and thousands of people- those who live here, those who rely on the rapidly-cancelling tourists for their income, and those who are trying to get in or out of the island (holla). The main airport on the island, in Denpasar, is currently closed, and there are lots of wretched people who are stuck at the airport having already checked their luggage onto the planes. Horrible. We’ve had a slightly rough few days- Elfie got a temperature of 39.6, and hadn’t been this hot before. I don’t think there’s a worse feeling that seeing your child ill and not being able to do anything about it. She is better now, just in time for Esmae to announce that she was very sick and puke everywhere last night. The two of them had a fun 3am wake-mummy-and-ask-to-watch-YouTube party, which might be my least favourite kind of party, ever. YouTube, at 3am, can you imagine! Of course, I upheld my high parenting standards and gave them my phone on YouTube and some neon-orange squash and went back to sleep while they watched kids pranking their parents. 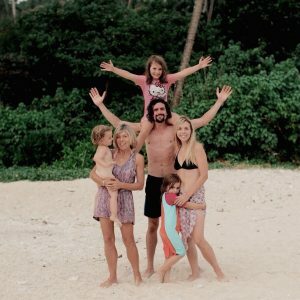 Funny travel stories: Stranded on Bali? We don’t know if we will be able to catch our flight on Thursday. What I do know is that we are extremely- extremely– privileged to be able to say, ok well we will stay in our homestay a few more days, and we have the money to go to the chemist and buy paracetamol, and go to the doctor in Sanur if we need to. We can buy a meal at the airport if we get stuck there (as much as I resent buying airport food) and we can speak English and talk to other English-speaking people while others will be stuck not knowing what’s going on. There’s a lot to be thankful for, and that’s just skimming off the top of the list I could write. But you didn’t come here for feel-goods! You came to hear about the worst bits of our trip so far, the gross, miserable, London-isn’t-like-this bits. So here we go. 1. Getting nits. Yes, that’s right. Patrick and Mum escaped this one, which is a pure miracle considering that between them they have more hair than the rest of Bali. But the kids and I got hit; maybe I should stop picking up lovable kids at the beach? Nah, it’s worth it. Thankfully by the time we found out we didn’t have any actual creepy-crawlies (writing this is making me retch), and yay for local chemists. 2. Having our credit card and bank card blocked at the same time. I mean, good on the banks to being alert to bank fraud, but when you’re thousands of miles from your ‘nearest branch’ it’s a little tricky to get money out to, you know, eat? Especially when the numbers given on the ‘contact from abroad’ page online don’t actually work. Patrick spent literal days sorting out the credit card which is thankfully fixed; we’re still working on the debit. 3. Fleas! Oh yes, the joy continues. You’d have thought I would have learned my lesson about picking up lovable things from the nit episode, but no. A cat at the warung where we eat every day kindly shared his friends with me, which Patrick discovered on my back when we got to the beach. Again, thankfully we got them off in a jiffy, but seriously, what the actual. 5. Elfie’s temperature. This might not sound like much but I’m not used to our kids being sick, and it is just the worst feeling in the world. We were worried she had over-heated but it seems as though it was a virus, as Esmae is now ill too. I can’t even imagine what it must be like to have a chronically sick child. 6. Excitedly opening my takeaway dinner wrapped in brown paper, to find it had been garnished with a single crispy-fried fly. I couldn’t decide if it was more gross or ironic (it was a vegan dinner). 7. Arriving in Ubud, at our very first destination, at our very first hotel, to dim grey skies, pouring rain and a lot of traffic. It started us off on the wrong foot as it wasn’t at all what we expected- however it has meant that everything else since has been better, so yay! 8. Bali belly. Not much to say. Pretty grim. 9. Being told we couldn’t board our flight from Singapore to Bali (because we didn’t have ‘onward’ tickets). Thankfully SkyScanner saved the day, we booked onward flights (the ones we probably won’t be able to get because of the volcano) and we were allowed to board. 10. Getting stuck in an outside, cobweb-y toilet in the 32C heat. One for the travel scrapbook. Or maybe not. So that’s our top 10 worst travel moments of this trip. We have a ton more funny travel stories from old trips; our backpacking trip around south-east asia, our honeymoon and our earthquake-prone trip to Turkey when Esmae was a toddler- maybe we’ll write about them one day. 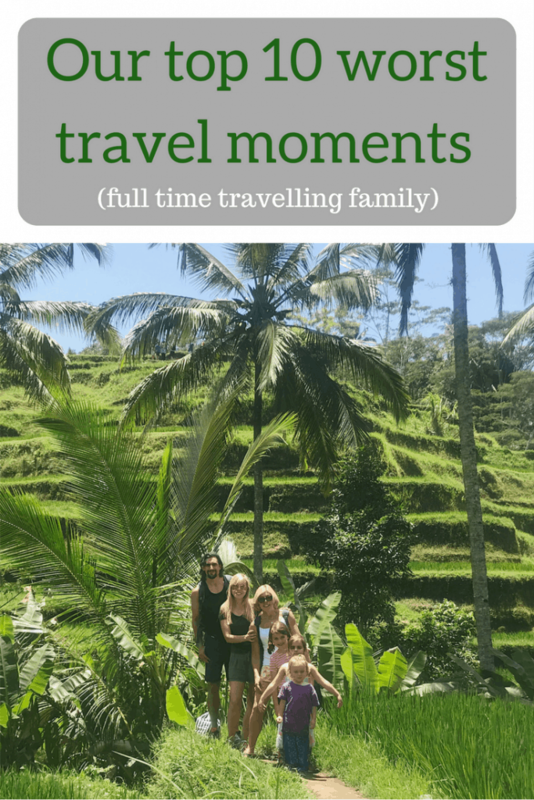 Check out how we adjusted to life as a full time travelling family here . For respectful parenting posts click here and for home education posts click here. To check out and subscribe to our YouTube channel click here. What have your worst ever travel moments been? Let us know your funny travel stories in the comments! 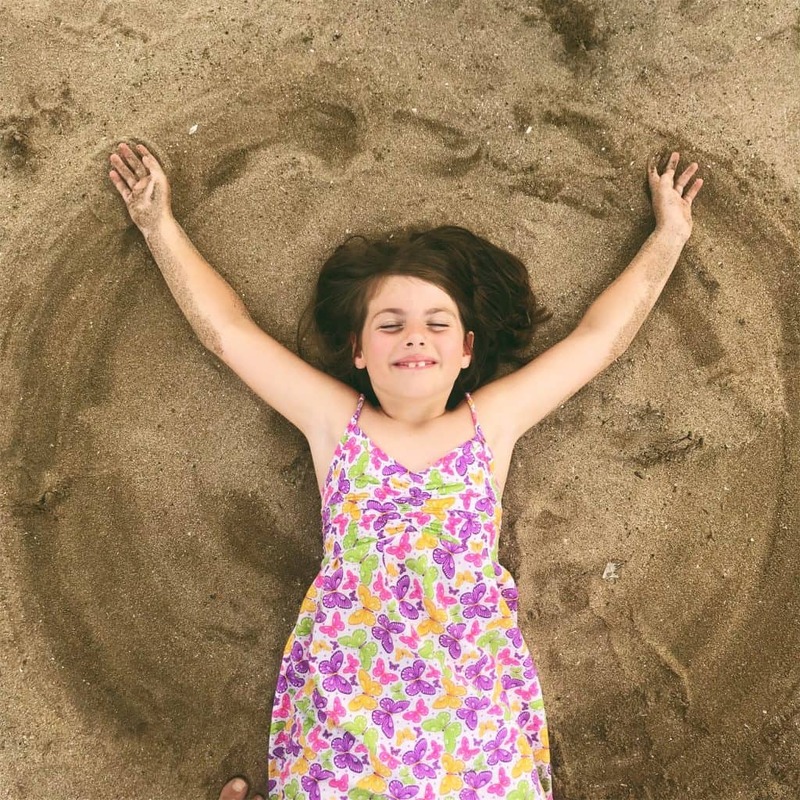 Glamping South Downs with kids: the BEST site!